I can't believe it has been a WEEK since my beautiful daughter was born! The memories of the hospital and my labor are slowly fading but one memory that isn't is how much my nurses LOVED the Push Pack I brought with me and how awesome they thought the product and idea was! They kept offering me free items from the hospital but I kept saying "No thanks" and I just went straight to my Push Pack and got out my own items from the bag! It holds EVERYTHING you need while you are in labor and after birth! The nurses were so impressed and I loved sharing about it! They had never heard of it and couldn't believe how many items fit into the little bag! The bag was the perfect size to fit into my hospital bag and easily fit everything I needed in ONE bag. Before I received the Push Pack, I had several of the included items in a couple other various bags and I was so happy to be able to combine them all in one easy to carry bag! Plus, the Push Pack took out the thinking about what to pack that I didn't have the time or brain power for before I headed to the hospital! It included so many items that I wouldn't even thought about bringing like playing cards, thank you's, the oatmeal! My FAVORITE part about the Push Pack is that the inventor of the Push Pack cares about using and including natural products as much as I care about using them! All the bath and body products are natural and/or organic and it was so great having travel sized natural and safe products to use after birth! I didn't have to drag along my full size products or fumble putting them in travel bottles! The pack even includes oatmeal which has really helped me improve my milk production as well as fills me up! Best of all, the Push Pack is invented by a mom, for moms and you know I love to support a fellow mom, especially one that values and understands how important natural and organic products are for our bodies! 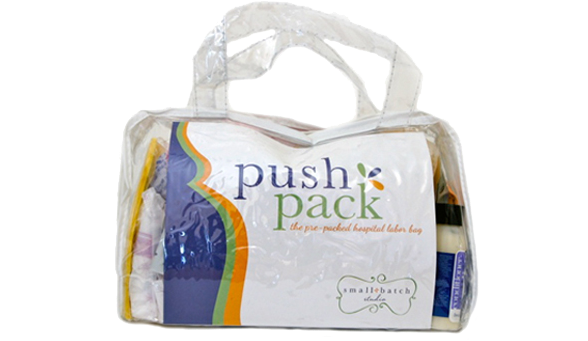 The Push Pack is a pre-packed hospital labor bag filled with the “little” things moms wanted & needed when they were in the hospital. First time mom – Eliminate the confusion of what to pack for your big day. The Push Pack contains items that moms really wanted and needed while they were in the hospital. Mom with kids – Now that you know what to bring you have other little ones taking up so much time, when do you have time to pack? Let us do it for you! Check one big thing off of your list and be ready to go. Dad – What if your wife isn’t packed, the baby comes & you are sent home to get her things … make it easy on yourself. Get a Push Pack filled with the things she’ll want and need. Only organic or natural bath and body products are used in the Push Pack. Can you believe all of this fit into one small bag!!!??? AMAZING!! Buy It: You can purchase the Push Pack for $65 from the Small Batch Studio website. 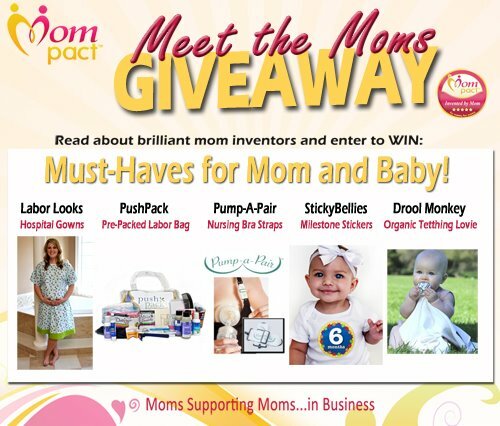 Win It: Mompact.com is generously offering (1) HUGE Giveaway Prize including a Labor Looks Gown, StickyBellies Milestone Stickers, Push Pack, and a Double Set Pump-a-Pair (over $155 value!) to a lucky winner! How do we enter? Thank you! Just log in to the Rafflecopter form and do the mandatory option of liking Mompact on Facebook. ok, just liked you on facebook.